As always it is not Apple that gives the first sign of an upcoming device release, rather, it is the suppliers and distributors that leak this info. The iPad 3 is still just a rumored device but we’re beginning to hear more and more about it as various suppliers begin to release and ship parts to distribution sources down the line. 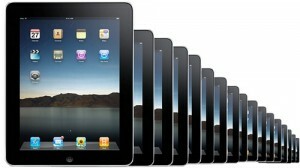 The most recent and most important event happened this week when a group of suppliers reportedly began shipping out iPad 3 display parts. According to sources the various manufacturers shipping the equivalent of approximately 1 million iPad screens which is a very promising number. No word on when the iPad 3 will be available but as more and more parts orders begin to be fulfilled we can only assume that the iPad 3 will be available sometime in the relatively near future.